The TravPad team is a group of friends who have collective experience of many countries of the world, and still enjoy travelling widely. While hitchhiking down a dusty road one day, two members wanted to know how far it was to the next bar. This led to talk about travel guides and how important ‘local knowledge’ was. They were disappointed at the lack of published local information out there and discussed a service they both wanted to see from travel sites in the future. They quickly decided that rather than waiting around, they’d have a bash at doing it themselves. They shook hands and that was the start of TravPad. We’ve used various social and traveling sites and we believe we know what travellers want; that is to get the local knowledge about a spot and then put it all in one place. You know, where to sleep and eat and what to see. This is what travelling and social websites should offer – not a chance to show off and make other people feel sad – about mutual cooperation and the free and easy exchange of information. We hope TravPad will offer an alternative to the more mainstream and more ‘polished’ sites. We, like many other travellers, know what existing sites lack and we also know what services are missing for us. We suspect that’s probably the same problem for other people. We think that travelling is about getting into the society you find yourself in. We believe the special experiences happen when you “get behind the scenes”. We know the special memories are formed when you get to know the things that the locals care about. We aren’t happy with the way things are. We want to change things. We want to build something useful and unique. That something is TravPad. This is the philosophy behind the project. We just started and we will add more features to the TravPad project. We started out with the Point of Interests (POI), the foundation of the site. Later we will add the social elements, like being able to hook up and hang out with local guides, sharing accommodation and hitching available rides. Stay with us to see. It’s a big project but we think it’s going to be fun! Some of the founding members of the team in Costa Rica. That day, we started talking about an idea which would later become TravPad. Tell a friend about TravPad! Ever Been Told to “Go To Hell”? You’d like that, wouldn’t you? Well you can’t go. You can stare into it, but you can’t go. But you can go to ‘Heaven’. For these are the names of two dramatic caves on the southern Turkish coast reached by a winding mountain road from the town of Narlikuyu. In Turkish, they are named ‘Cennet Çökügü’, or simply Cennet (‘Heaven’) and Cehennem Çukuru, or Cehennem (‘Hell’). They are interesting for those who like geography (particularly caves) and also those who like mythology. 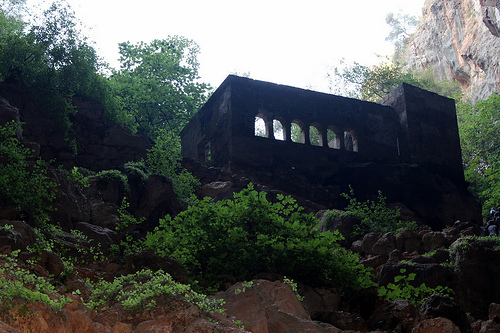 The mythology of these two places are fascinating. Heaven involves a descent into a valley, or a pit. Down over 400 steps, the air gets colder and everything seems still, the cavern opens out in front of you. Birdsong bounces off the walls of the valley, giving a slightly disorientating feeling. Keep an eye open for the hundreds of pieces of cloth which have been tied to the tree branches – visitors exhibiting religious ritual. Continuing the walk over to this enormous wound in the rock makes you feel very small indeed. The valley is over 100 metres wide and almost 100 metres deep. The mouth of the cave yawns in front of you. The big shock is when you see what’s in the cave though. Yes, that’s right, it’s a 5th century Byzantine Chapel – you really can’t move for them these days. It’s called the Chapel of the Virgin Mary, and we’ll see how that came to be there, later. Heading past the chapel you go further into the cave. A table and chairs have been rigged up to provide somewhere for a bit of a rest. Not at the top – at the bottom. 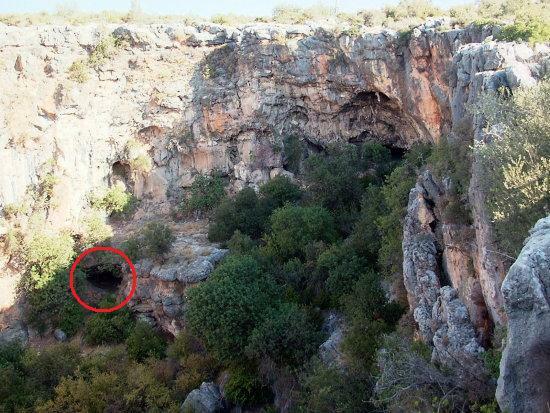 It’s not possible to go right to the very end of the cave, as last reports indicate that it was blocked off by a barrier. But beyond this barrier is a free running underground stream (videos of this underground water source can be found online). In winter, when there’s more water running here, the stream can be heard as quite a distinctive roar apparently. 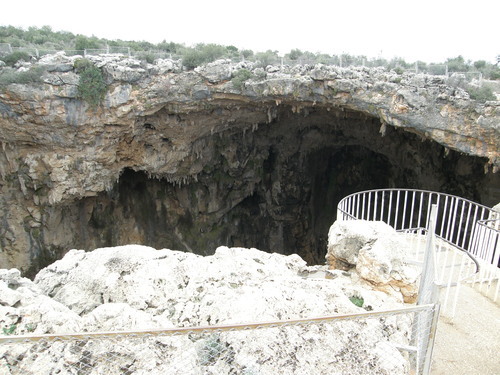 It was this noise which convinced ancient peoples who visited the cave, that within the depths of this dank place, lived a monster (see the note on ‘Typhon’ below). The chapel mentioned above was so placed to try to neutralise and defend against the threat posed by this monster. Going back up, into the burning sunlight, thoughts turn to ‘Hell’. Wandering over and away from Heaven, this cave is a massive sinkhole. The floor of the cave is inaccessible. The bottom of this huge chasm, or pit, is some 130 metres straight down. Apparently, there was, at one time, a steel ladder which led to the bottom of this pit, but there were no signs of this. The best view you can now get is from a steel viewing platform which is positionedslightly beyond the lip of the chasm, and overhanging the drop. Not for the faint hearted. The sides of Cehennem look scorched. This is where the mythology comes in. 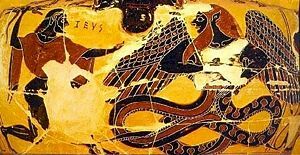 The King of the Gods Zeus, was said to have battled Typhon, ‘The Father of All Monsters’ – a creature with over 100 serpent heads. Getting the upper hand on this slippery devil, Zeus threw Tyhpon into Cehennem, where the beast remained imprisoned. The scorch-marks are said to have been caused by Typhon’s fiery breath, in its rage, unable to escape. So, as you can see, in this case it really is easier to get into ‘Heaven’ than it is to get into Hell. Quite terrifying waterfall (“big water”) on the borders of Brazil and Argentina. It falls around 269 feet. The fall is made up of hundreds of smaller waterfalls, depending on rainfall. In terms of surface water flowing over the falls, Iguazu Falls is over twice as large as the perhaps more famous Niagara Falls. It’s been featured in both Bond and Indiana Jones films – not to mention Miami Vice. Legend has it that an ancient god planned to marry a beautiful woman. She spurned the almighty for her mortal lover. They both foolishly paddled off together in a canoe, looking forward to some ‘together time’, banking on the fact that the god was probably going to be a good sport about it. You guessed it, no, no he wasn’t. In rage, he sliced at them on the river, creating the waterfalls and condemning the lovers to an eternal fall. 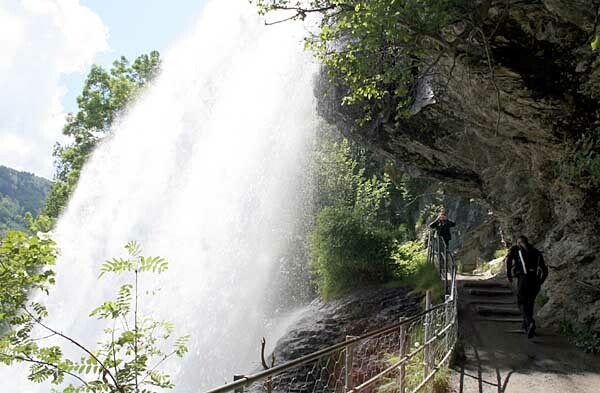 The highest waterfall in France, plunging a powerful 420 metres. A stunning waterfall, set in even more jaw-dropping surroundings, the Gavernie Waterfall is a temperamental beast. In the hottest of summers, it’s a torrent. In winter – even with a sniff of a cold breeze, it just stops flowing. This is largely due to the fact that it is sourced from the glacier above it – in actual fact, on the Spanish side. The waters sink underground, then surface on the very lip of the fall, before thundering down into the rocks below. The Skógarfoss is one of the biggest waterfalls in the country with a width of 25 metres (82 feet) and a drop of 60 metres (200ft). According to legend, the first Viking settler in the area, “Þrasi Þórólfsson”, buried a treasure-chest in a cave behind the waterfall. The legend continues that, after a particularly cold summer, when the ice-melt wasn’t too great, the waterfall had a reduced flow – incredibly rarely. One of the rings of the treasure-chest became visible. A local bravely climbed up and grabbed for the ring, found it, and clung on for dear life. Eventually, the handle of the chest could not hold his weight and broke free from the chest. The ring was allegedly given to the local church. The old church door ring is now in a folk museum, a few hundred metres away where it can be seen. A particularly amazing option – and one not to be missed – is the fact that you can camp on that patch of grass you can see to the right of the picture. This means that the rumble of the falls lulls you into your slumber and the clean, iced, crisp smell of the glacial waters assaults your nostrils when you awake. 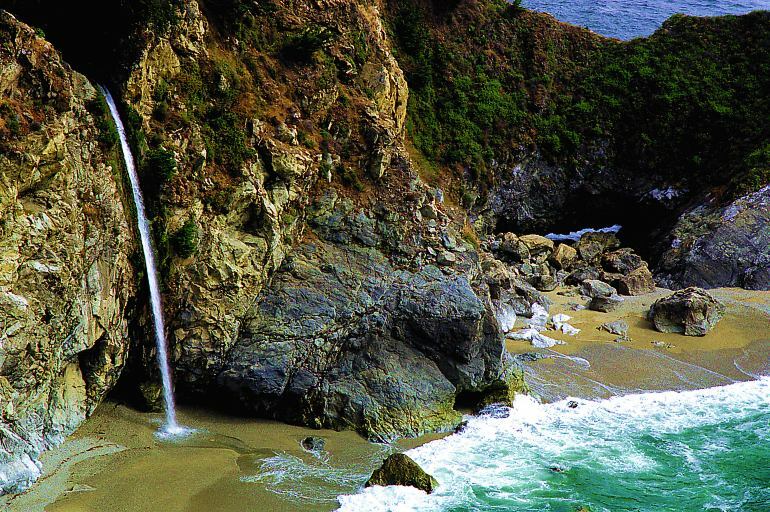 It is actually correctly called a ‘tidefall’ and is rare in that it empties directly into the ocean. Not many waterfalls have this feature. The drop is quite modest to some of its American cousins, but the sheer beauty of this fall and the cove in which it empties makes this little place quite special. 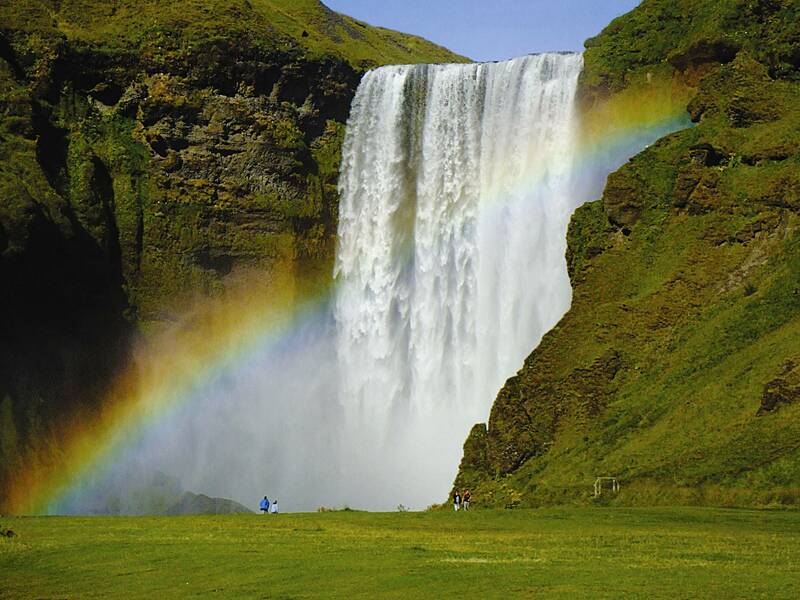 The waterfall is only 50 metres high and is best visited when glacial melt swell the waters. It is one of the most visited waterfalls in Norway because of a rather unusual feature. Steinsdalsfossen leaps right over the edge of a cliff, and also over a path, on which pedestrians can wander underneath it. Looking up, you can plainly see the hundreds of tonnes of water thundering just past your head, whilst keeping your feet completely dry.